Blogging has had to move down my priority list over the last few months. I spent September and October immersed in stimulating literature festival events and delivering workshops to adults in the community as part of my role at the University of Leeds. Then I was struck with a nasty respiratory illness and laryngitis – a liability in my line of work. 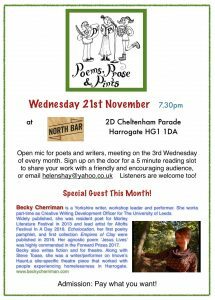 I’m now almost in full voice and looking forward to reading at my old haunt of Poems, Prose and Pints in Harrogate next week. I haven’t been a guest since 2012 so it will be great to attend again in its new shiny venue of North Bar. I’ll be trying out some new work as well as reading from my collection and pamphlet. If you’re a writer do come along. You can sign up for the open mic or just watch and listen. The other opportunity I’m writing to tell you about is a weekend workshop I’m delivering in Mexborough as part of The Ted Hughes Project on the first weekend in December. We decided to cancel the course I mentioned in my last blog due to an unfortunate clash with Ian Parks’s poetry group which runs on Tuesdays at the Mexborough Business Centre. Sometimes scheduling problems can lead to creative solutions. The Poetry Pamphlet In A Weekend course was ours. This is for poets at any stage of their writing career who are thinking of putting together a poetry pamphlet and costs the teeny sum of £10 for the whole weekend. Yes, you are reading that right: £10. I’m so excited about seeing how poets’ work comes together over the weekend and being a part of that. There is also a novel writing course by Mslexia novel competition and Northern Writers Award winner Stacey Sampson. Details of both courses are on the website. There are only 15 places for each so you’d better book quickly. 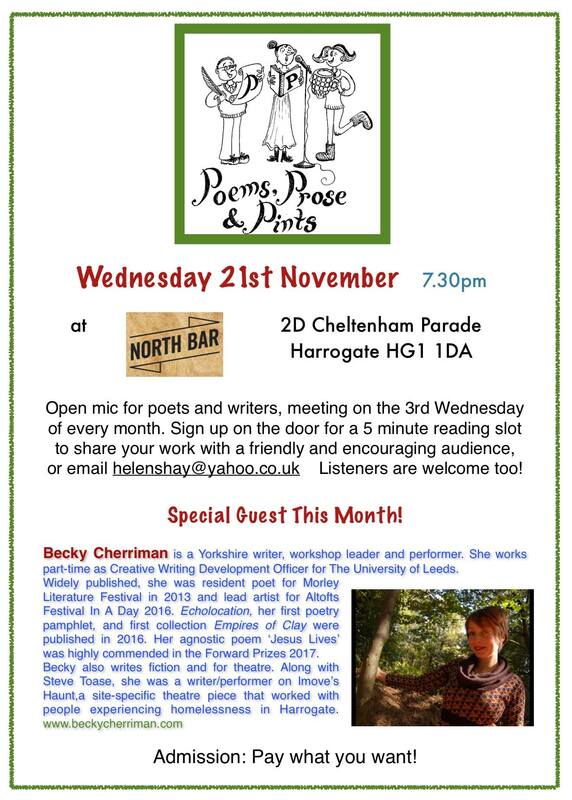 Weds 21st November, 7.30 pm, Poems Prose and Pints, 2D Cheltenham Parade, HG1 1DA, Pay what you want. Just turn up. Saturday 1st and Sunday 2nd December, 10-4, Poetry Pamphlet In A Weekend, Mexborough Business Centre, College Road, Mexborough, S64 9JP. £10. Email info@tedhughesproject.org or message us on Facebook to book. Hope to see some of you at one or both the events.